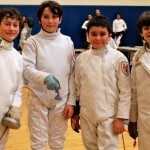 Since he started fencing, nine years ago, Joshua Wolkoff charmed everyone with his big smile and his friendly personality. 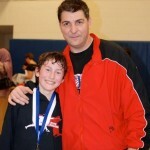 Josh rarely skipped any classes and has always been grateful and thankful to his parents for giving him the chance to take private lessons and travel for competitions, even if that meant financial sacrifice from their part. Josh is very recognized among his fencing peers by his “deadly” parry eight, which, as many say: “once you got in, there is no way out”! Over the years, we got used to seeing him always sporting a medal around his neck or a cup in his hands. This year, at the age of 17, Joshua has been qualified for the European Cadet Circuit, a strong competition where only the top 20 Cadet fencers in the US are admitted to fence. And he didn’t disappoint – 84 epeeists from 11 countries have crossed weapons in this major fencing event and Joshua placed number seven! 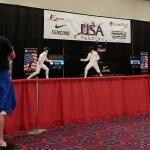 Coming 21st out of pools, Joshua entered the top 64, winning to Italian Sergio Cicero and in top 32, to American Nick Wilson, from Alliance Fencing Academy (TX). 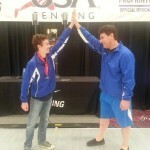 Then he fenced the next DE with Wolfe Crouse, from Woodlands Fencing Academy after which he lost for the semifinal to the winner, American Isaac Shelansky, from DC Fencing Center. We’re very proud by Josh’s fencing on the other side of the Atlantic and looking forward to celebrating his result, at his homecoming! 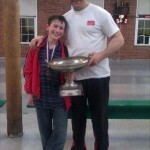 Here are few images of Josh, when he was much younger, under the tutelage and guidance of Daniel Hondor, his coach and mentor, over the years. 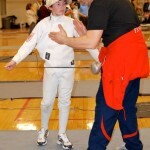 Joshua is Daniel’s second student to qualify and attend a World Cup – Alejandra Trumble (currently on the University of Pennsylvania fencing team) has done it five times. She fenced two times each in Sweden and France and once in Austria. 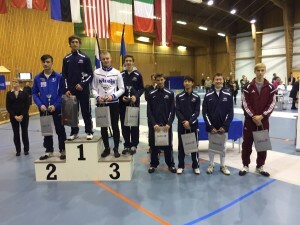 This entry was posted in Club News, Uncategorized and tagged Daniel Hondor, European Cadet Circuit Helsinki, fencing medals, fencing world cup, Joshua Wolkoff, Olympia Fencing Center, top 8. Bookmark the permalink.